Who agrees with me that banana splits are a totally underrated dessert? Though they’ve been around forever and are totally a thing, you never really hear people talking about them and rarely see people ordering them. Hot fudge sundaes, yes. Brownie sundaes, yes. Cone head sundaes, of course. I happen to think banana splits are a ridiculously amazing innovation, but I’m not even sure I’ve ever ordered one out before. They’re a little over the top and almost feel a little excessive, but really in the best way possible. So, of course, I had to take the classic banana split and reinvent it for breakfast with this Banana Split French Toast. Because over the top and excessive is my middle name. Especially first thing in the morning. I did manage to hold myself back a little bit and didn’t top the french toast with ice cream… Which is kind of a very important part of an ice cream split. But would also be a little too excessive even for me. Instead of just making regular french toast with banana on top, I blended bananas into the milk and egg mixture that I soaked the french toast bread in. This really helped to infuse the banana flavor throughout the french toast in the most awesome way. 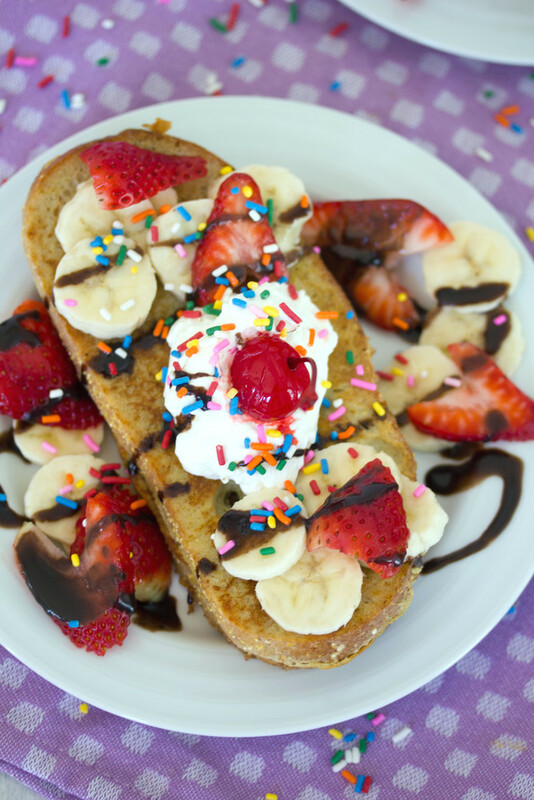 Once the french toast was made, I simply topped it with banana split favorites, including more sliced bananas, strawberries, chocolate sauce, whipped cream, and lots and lots of sprinkles. Oh, and also a cherry on top. Which in my case just happens to be a “boozy” cherry since I ran out of the regular variety. Oops. 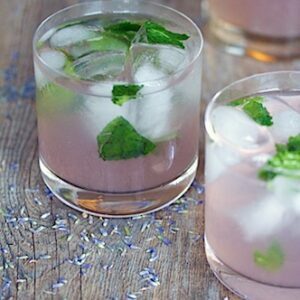 Doesn’t it look like a party on a plate? To me, this is the kind of breakfast you want to wake up to on your birthday. 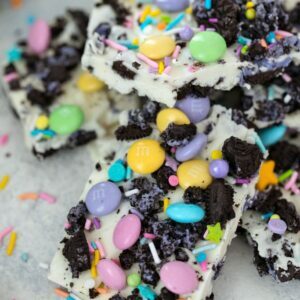 Special and fun and rainbow sprinkle-filled. It’s a special occasion breakfast that will immediately put you in the mood to celebrate. But the thing is… for as excessive as this french toast looks, it’s actually not all that bad for you. Sure, there’s some chocolate sauce, but really only a drizzle. And there’s just a dollop of whipped cream. I made a homemade version, which consists of just heavy cream, a little sugar, and some vanilla. So, you can have this as a special occasion breakfast or you can make it on a Monday morning when you’re trying to amp yourself up for a rough week. If there’s any reason to get out of bed on a Monday morning, I’m pretty sure Banana Split French Toast is it. I also think this dish is going to mark the beginning of my new obsession to have rainbow sprinkles for breakfast. Remember how I recently bought 7 pounds of them? Well, they actually do have an expiration date… Which means you’ll likely be seeing a whole lot of sprinkles on my blog in the coming days. Sorry not sorry. I’m totally bringing banana splits back. And loving every minute of it. What classic dessert would you turn into a breakfast food? 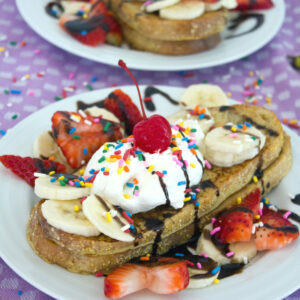 Banana Split French Toast is banana-infused french toast with all the classic banana split toppings. A traditional American dessert reimagined for breakfast! Put milk, eggs, 1/2 tsp vanilla, and 2 small bananas in a blender and blend until smooth. Pour mixture into shallow dish and dip bread slices in, making sure to soak each side. Place a large skillet over medium heat and melt half of butter. Place bread on skillet and cook until golden brown on both sides. Repeat with remaining butter and bread. Place heavy cream in the bowl of a stand mixer with whisk attachment (or in a large bowl with hand mixer) and whip cream until soft peaks form, about 2-3 minutes. Add sugar and 1 tsp vanilla when cream is almost fully whipped. Arrange two slices of french toast on a plate and top with bananas and sliced strawberries. 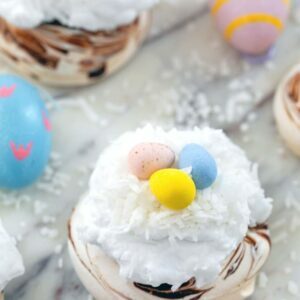 Drizzle chocolate syrup over the top and top with a dollop of whipped cream. Sprinkle rainbow sprinkles over entire plate and top whipped cream with a cherry if desired. 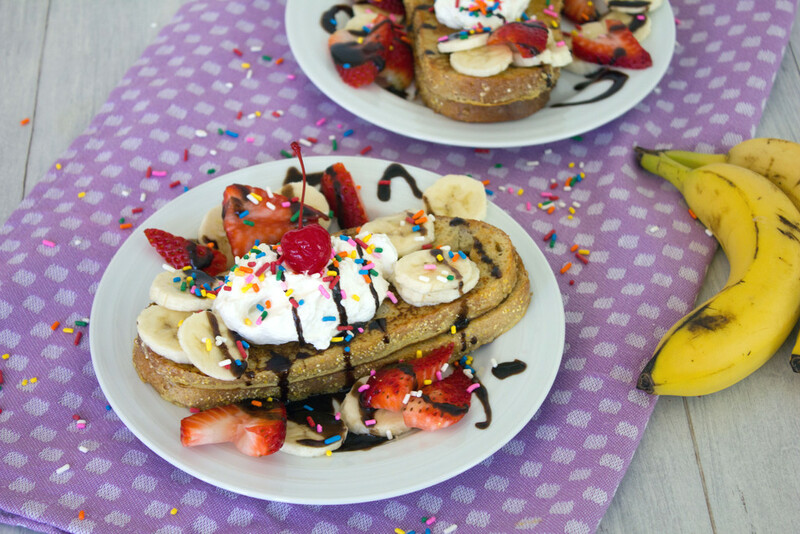 13 Responses to "Banana Split French Toast"
this is just about the happiest, prettiest looking breakfast ever. I agree, Banana splits are underrated. now I want one! 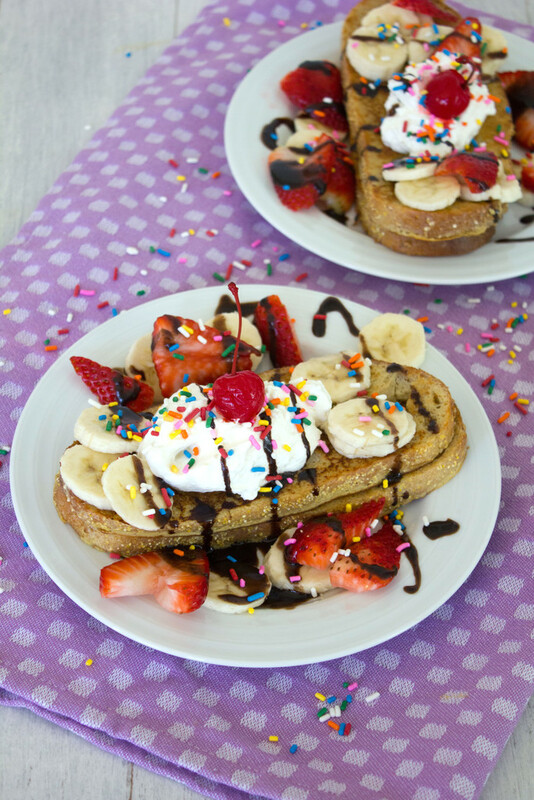 I’ll have to make this for my nieces sometime – they’d freak over having sprinkles and chocolate sauce for breakfast! P.S. Also love the idea of blending the banana into the egg batter – genius. Well this is fun!!! I’m on a bit of a banana split kick too! Except I forgot about the sprinkles! I need to get on that! 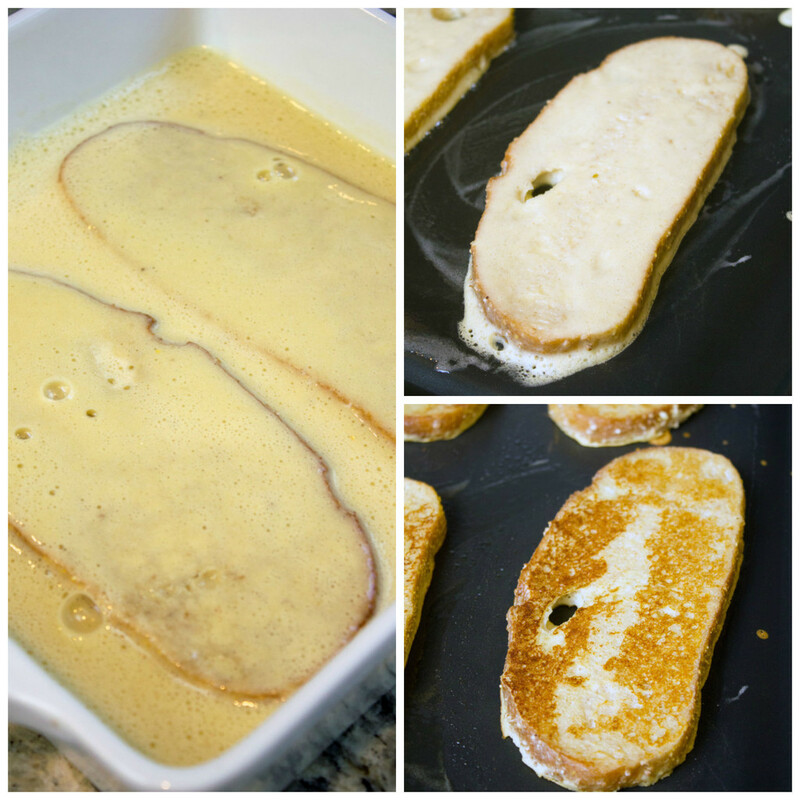 French toast is an all-time favorite and now you’ve taken it to a whole new level, my friend! You know I’ve never had banana split French toast?! I didn’t know what I was missing until now! I love banana splits (I mean, who doesn’t, right?) 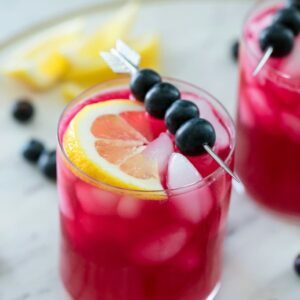 This recipe looks so fun and delicious. Yummy!! Now this is the ultimate french toast! I wish I had a big stack of this to start my day. 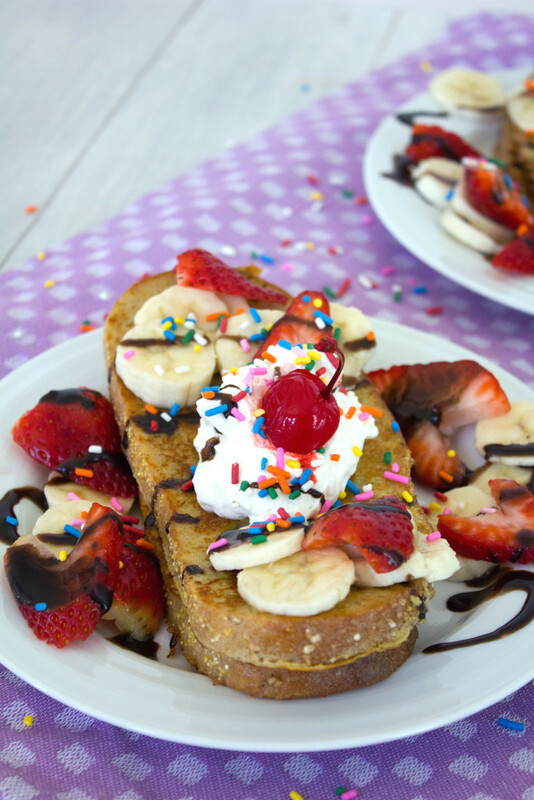 Who can resist frenh toast with all of my favorite banana split toppings? Right there with you – banana splits are totally underrated 😉 Absolutely love the sound of this! I am loving everything about this!! 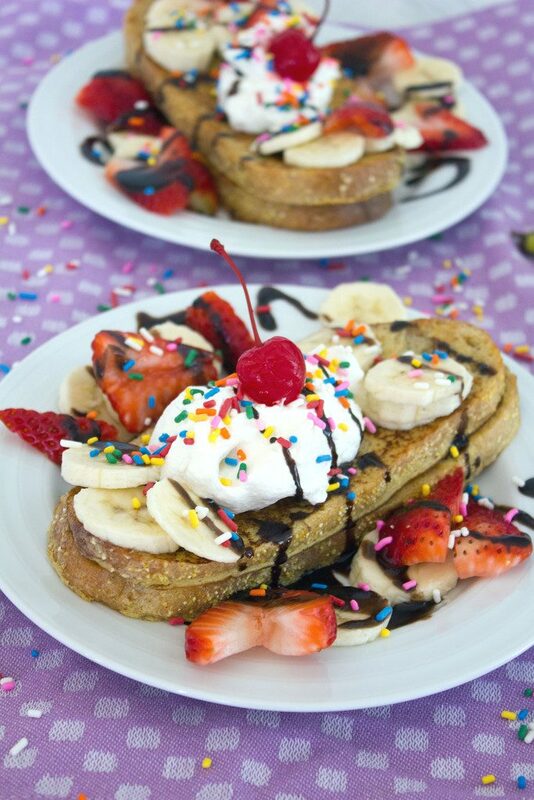 French toast with banana split looks so good!! You’re totally right. French toast will never be the same. This is totally out of this world and amazing and I really wish I would’ve had this for breakfast instead of my piece of flimsy toast. Can’t wait to try this!